Here is a recent article that was posted by HMS Industrial Networks that shows that Industrial Networks is expanding globally. 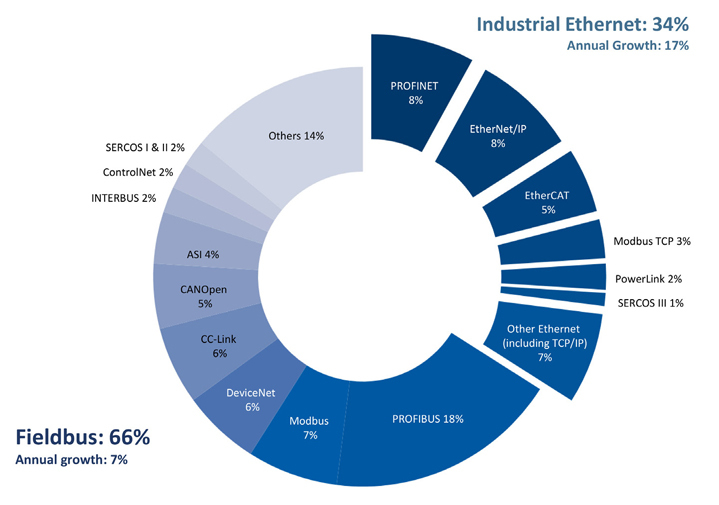 This indicates that Fieldbuses are still the most common network with 66% market share, with industrial Ethernet having 34% of the market. It looks like Industrial Ethernet networks (17% per year) is expanding faster than fieldbuses (7% per year). According to HMS, PROFIBUS remains the most widely used industrial network globally but several networks are closing up. PROFINET and EtherNet/IP compete for first place within industrial Ethernet and no network consolidation is in sight. Here are some of the trends HMS sees within industrial communication right now. Both fieldbus and industrial Ethernet networks are growing, but Ethernet is growing faster than the other networks. Looking at new installed nodes within factory automation globally, fieldbuses are still the most widely used type of network with 66% of the market. An interesting fact is that HMS sees fieldbuses still growing by approximately 7% per year. The main drivers for fieldbus growth is simplicity, tradition and reliability. The dominant fieldbus is PROFIBUS (18% of the total world market including industrial Ethernet) followed by Modbus (7%), DeviceNet (6%) and CC-Link (6%). Industrial Ethernet networks make up for 34% of the market and are increasing faster than fieldbuses (17% per year), but HMS concludes that it will take some time before Industrial Ethernet outgrows fieldbuses. The main drivers for Ethernet growth are higher performance and office network integration. PROFINET and EtherNet/IP are the two biggest Ethernet networks with 8% of the total network market each. Runners-up are EtherCAT, Modbus-TCP and POWERLINK. In Europe and the Middle East (EMEA), PROFIBUS is the dominant network while PROFINET has the fastest growth rate. Runners up are Modbus and EtherCAT. The US market is dominated by the CIP networks where EtherNet/IP is overtaking DeviceNet in terms of market shares. Runners-up are PROFIBUS and EtherCAT. Furthermore, PROFINET gains market shares and Modbus is still popular. In Asia, no network stands out as truly market-leading, but PROFIBUS, DeviceNet and Modbus are widely used. CC-Link is dominating in Japan, and EtherCAT is also gaining traction. “With more than 25 years of experience in industrial communication, we have a very good insight in the industrial network market,” said Anders Hansson, Marketing Director at HMS Industrial Networks. “What is completely evident, however, is that the network market remains fragmented and that industrial devices are getting more and more connected. This is accentuated by trends such as Industrial Internet of Things and Industry 4.0,” Hansson said.